With Outlander's North American release date one month away, We got in touch with David Kuklish - The visual effects supervisor on Outlander - to ask him a few questions about working on the film and it's crazy creature effects! Want to know how they enhanced the creature's interaction with the real sets? Want to know how big the Moorwen really is? Read on! Can you introduce yourself to us? Can you tell us a little about your background and how you got into the industry? As I got older, this interest became more focused, and I started making my own miniatures and special effects. By high school, I knew exactly what I wanted to do. I headed straight for Los Angeles after college and got a job designing and building mechanical special effects. Gradually, as I got more into miniature work, I started shooting the effects and miniatures myself and at the same time got heavily into computers and hardware, especially early 3D programs and motion control. I feel fortunate that I started in the industry at a time when I got exposure to the "old school" way of doing things... even some optical compositing. This early non-digital experience has been at the core of how I think about visual effects. What are some of the other projects you've been attached to before you were chosen to be the effects supervisor on Outlander? I've supervised a lot of projects before, but Outlander was the largest production I had worked on up to that point. The film that led into it was a smaller movie for director Jonathan English called "Minotaur" which featured a very cool CG creature. It came out looking quite good, especially considering the budget and I think that is one of the reasons the producers of Outlander brought me on for this picture. Can you tell us what drew you to this project? 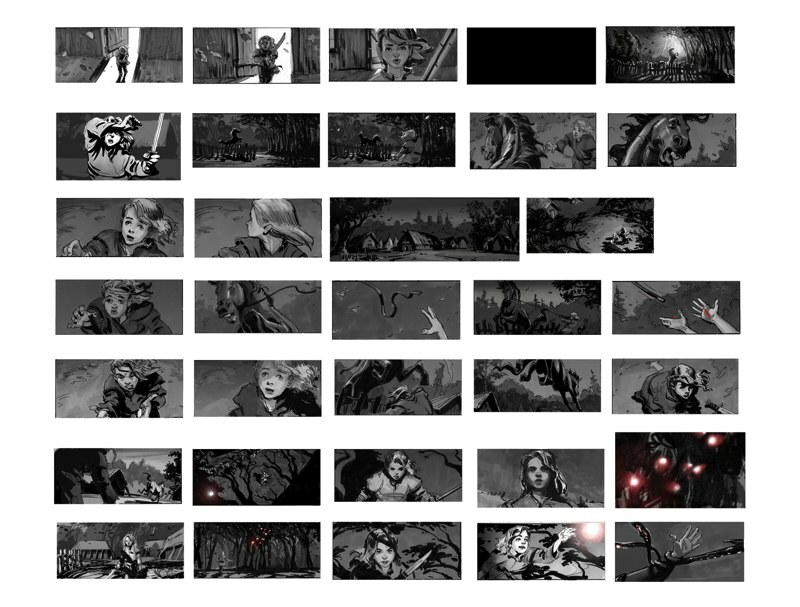 I suppose the biggest attraction was a set of animatics that Howard McCain and our editor, David Dodson, had put together for Outlander before I got on the project. They did a beautiful job on them, complete with music and sound effects. I was instantly hooked. The concept behind Outlander also felt to me a little bit like "A Connecticut Yankee in King Arthur's Court." This is one of my favorite themes, where a guy from an advanced civilization has to go and live amongst the inhabitants of a more primitive society. There is just something really intriguing about watching the primitive people's fascination with the new stranger. I think this may be the very essence of science fiction for me. Most of all however, who wouldn't relish the opportunity to work on this project? After all, Outlander has a little bit of everything in it: alien creatures, battles, spaceships, fire, explosions, underwater action... all types of cool stuff. To top it off, Howard had envisioned a very stylish Viking World that was just begging to be brought to life. This was not just your "normal" period environment: it bordered on fantasy and screamed "sci-fi". At what point in the project's lengthy pre-production life did you come on board? What are the duties of an effects supervisor on a project like Outlander? VFX Supervisor, Joe Bauer, a close friend of Howard's, was originally slated to supervise Outlander and did some preliminary breakdowns and tests, but he was also attached to "Get Smart". When that project was greenlit, he couldn't do both and I was fortunate enough to come onto Outlander at that point. I really had a lot of work to do on Outlander, but fortunately I also had the help of two other very talented supervisors, James Tichenor and Jeff Campbell. These guys primarily supervised the digital work in their respective digital facilities, but they were also out there on the set, in the trenches, helping supervise the shots. They deserve a ton of credit for how good everything looks. My main duties started with laying out the basic vfx methodologies we were going to use, presenting these to Howard and the producers, and then eventually planning the more nitty gritty details of how we were going to do the shots. During pre-production, I worked with the various department heads and our digital vendors to make sure everyone knew exactly what to prep and do during shooting. During production I supervised every day (and night) on set and shot a lot of the effects elements myself. I also supervised most of the aerial cinematography. During post-production I spent most of my time in editorial with Howard and David Dodson, putting the scenes together, doing design work, and trying to identify all the various layers and elements. [Read our interview with editor David Dodson] Sometimes I would spend time at the digital facilities, but since Outlander was so editorially intensive, most of my time was spent in Los Angeles where editorial was based. One of my other duties was to keep track of all the shots for Production. This was a huge task, and required careful organization or else chaos would quickly ensue. Keeping things organized in a project like this is essential so that confusion doesn't overwhelm the creative process. How would you describe your working relationship with Outlander's director? Some directors know exactly what they want to see where others perhaps allow the whole process to kind of dictate how an effects scene might play out. Well, Howard is definitely one of those types of directors who knows exactly what he wants to see, at least in the case of Outlander. This may be in part because the project had spent such a long time in development, and he had a lot of time in which to visualize the film. Early on, Howard did a significant amount of visual development with Ian McCaig at Ninth Ray Studios. Because of this early design work, the visuals were woven into the script on a multitude of levels. This especially benefited the visual effects by adding clarity and consistency to Howard's vision. He had really put a lot of thought into it. As is often the case on a big project, and Outlander was no exception, the VFX Supervisor has to work very closely with the Director, anticipating what he is thinking as much as possible and taking over at times when the shots get really complex, or when there are multiple units shooting at the same time. This requires a lot of trust on the part of the Director, and for the Supervisor means a lot of careful listening and observation. So with this in mind, during production, Howard, David Dodson and myself all rented a big old house together in Nova Scotia. Dodson installed his editing system in the dining room. If you don't mind working on a project literally 20 hours a day, it's a great thing because it allowed us to communicate extensively during the shoot. We were able to strategize the next day's shooting, talk about what was working and was not working, and perhaps most beneficial of all, commiserate with each other during the extremely long and tough days. I have to say I really enjoyed working with Howard. He is exacting, and has a level of concentration that brings a lot of storytelling to every shot. Though he is appropriately partial to his own vision, he also gives a lot of consideration to other ideas and opinions. He also is super-passionate about the work and really gives it his all, which makes you want to do a good job for him. To some degree effects work is a creative process - making the impossible seem like reality on screen. To what degree did Outlander demand a more inventive approach to getting the shots needed? With some shows you have to deal with a lot of "ethereal" effects such as wormholes, vortexes, magical "beams" and whatnot. Nobody really knows what these effects "have" to look like and often they can be very difficult to reach consensus on. On Outlander however, despite their fantastic nature, the effects were a lot more grounded in reality. Even the bioluminescence of the creatures was a real, physical-looking effect based on biological organisms. These types of effects either look real, or they don't. A matte painting extension of mountains either looks real, or it doesn't. A good creature integrates properly into the scene and looks photo-real ... or it doesn't. So on a lot of the effects, we weren't able to cut many corners. We just had to go out and do as good a job from the outset as we possibly could. This often meant we were trying to get as much "in camera" as possible so that less work was left to do digitally. We tried to shoot as many physical elements as possible to both take the workload off of the CG department and also to increase the photorealism of the elements. Against greenscreens, we shot a large variety of blood splats, foot stomps, flying debris, slime, flames, splashes and similar elements. These were all added tracked and layered into to the composites later on. By the end of the project there was a large library of photographic elements for the compositors to work with. We also did a lot of 3D cyber scanning of our props, sets, and actors. This was done not only to save on 3D modeling and texturing for specific vfx shots, but also to act as a digital backup for Production just in case we needed to create a major non-visual effects shot. We were moving so fast during production that the producers felt we needed this extra insurance in case we missed something big...there was no going back to these sets. Outlander reportedly has over 500 visual effects shots. How did this film compare in scope to some of your past projects? Outlander had well over 600 shots originally, many of which were actually worked on, however only 540 or so made it into the final film. Some projects I've done have had more shots than that, but the difference is that usually there were more numerous "smaller" shots. In contrast, on Outlander, most of the shots were "big" in some way. Whether it was in the amount of CG work required, matte painting needed or 3D characters that had to be animated. 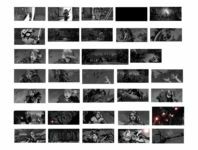 The 3D character animation doubled or even tripled the amount of effort over a regular vfx shot. What inspires you most in your job? Invention fascinates me, both on the screen and off the screen. For example, an on-screen "invention" was the set of rules that we came up with that explained how the Moorwens used their bioluminescent light to communicate and attract prey. At first it was rather random how we approach the bioluminescence scenes, but gradually, we came up with a set of behavioral rules for the animals. Not only was this fun, it made thinking about the shots easier. The rules actually added to the pool of creative ideas because they opened new possibilities of behavior that we may not have thought of without. Off camera, I am constantly inventing systems to help in making visual effects: whether it be a tool to measure lens angles, a special flying camera rig or even a weird 3D construct to convert camera moves into motion control. I think this directly relates back to my experiences building things as a kid. I also get a lot of satisfaction out of recreating reality. There is something very interesting in breaking down a shot into the basic visual elements that make it seem real to the human eye. For me this is where physics and photography meet: for instance in matching a real lens with a 3D lens, observing the basic laws of perspective, matching scale weights and speeds in a miniature, or properly layering atmosphere into a composite. I find these things all very fun and I really enjoy the scientific part of it. Nowadays, with the above fundamentals more second nature, I am more and more enjoying just thinking on a pure visual level, for example how an action will affect the composition of a shot, or how to best tell the story with the visual. When you spend all your time concentrating on the technical aspects, it is easy to miss the big picture of what you are really doing. Every project has difficulties. What would you say were the greatest challenges working on Outlander? How have you grown (and what have you learned) from facing these challenges? One of the main challenges for me was that the production company didn't have a dedicated VFX Producer on the project (or any official vfx staff besides myself for that matter) and this meant that I had to be deeply involved in many non-creative aspects of the vfx. This was difficult considering the amount of creative attention the project demanded. Early on, I enlisted the help of Visual Effects Producer, Jim Livolsi in Los Angeles, who found a digital vendor ideally suited to the financial requirements of the production, Because of budget constraints however, he then went on to work directly for our main vfx vendor. This unfortunately meant that a lot of the management and monitoring tasks for the production company fell back onto me. I was doing two full-time jobs, supervising and producing, each of which was difficult in its own right. This was probably the single biggest challenge I faced and not something I would want to do again on a film of this size. The scope of the project was also a challenge. We had shot a bigger film than either our strained vfx budget or our impossibly tight post-production schedule would allow us to finish. What made it even worse was the extremely short period of time allotted for editing. The problem was that we couldn't be exactly sure which visual effects sequences would remain in the film and which would be cut, and in order to keep our "bases covered" we had to do at least some development work on all of the sequences. As a result, we were forced to spend valuable time and resources on shots that weren't necessarily going to make it into the final picture. This was a constant juggling act as the editing of the film progressed, and one that did not come without repercussions. The shooting also had its share of logistical problems. Shooting the big waterfall for the ending scene was one of them. Because our main shooting locations in Nova Scotia didn't have much in the way of waterfalls (or even mountains for that matter), we had to go half way around the world to find appropriately huge waterfalls, and then shoot these separately from helicopters. The problem was in that in the dead of winter, most of the good waterfalls in the world were frozen: and unreachable even by helicopter. We had to wait until spring, very late in post-production, until any of the mountains were melted enough to allow the water to flow freely. To say we were cutting it close is an understatement. For our main waterfall, we ended up going to Norway to shoot this huge waterfall named "Mardalsfossen". Just getting to the falls was a three-hour helicopter journey from Oslo with the gyro stabilized Wescam attached to the front. Using Norway's elaborate system of web cams, we carefully watched for a weather window that would allow us to get there, shoot, and then get back again safely. To get plates that would match the extreme angles of our greenscreen footage, our pilot had to hover directly overtop the 1500' tall precipice, right above where the water was cascading over the edge, and hold the chopper as steady as possible. This type of shooting is as exhilarating as it is difficult and takes a lot of planning, but there is really no other substitute. The principal photography schedule was also very hectic. In the last week of filming, we were actually running three separate stages, each of which was shooting heavy visual effects scenes. (Somehow the big vfx stuff always gets left until the end). Jeff Campbell was supervising on one stage, Chris Roberts, our main producer, put on his VFX Supervisor's hat and ran a second stage, and I was shooting last-minute blue and greenscreen elements of the principal actors on a third stage. It was a crazy affair, but somehow we ended up getting through it with most everything shot. Physically speaking the shooting was really tough. The cold in Halifax was such that during nights, our laptop computers (with the pre-visualizations on them) were caked with frost all over the keyboards. Even worse than that, our exterior bluescreens kept "icing up". Before every take we had to heat them up with big lights and broom all the ice and frost off. That was a first for me! As a result, I learned quite a bit about cold weather shooting. Perhaps most importantly, I learned not to make fun of those big dopey looking coats you see people wearing up north. In the film, the Moorwen has to interact with people, and fire, and has some unique lighting characteristics. Was there any kind of special planning needed to make sure that what we would end up seeing on screen would be convincing? One of the most interesting things about these Moorwen creatures is that they self-illuminated with patterns of bioluminescent light... especially when they got mad! It really added a whole other thematic level to their character and to the effects in general. To figure out how we were going to create this bioluminescence, we first took a close look at footage of deep-sea creatures: the cuttlefish in particular and also the angler fish (that funny fish with the little glowing whisker thing under its chin) and also a bunch of other really weird looking critters. Its sounds too amazing to be true, but in terms of bits and bytes of data, bioluminescence is the predominant form of animal communication on earth. There was no shortage of interesting creatures to draw inspiration from. Armed with these visual ideas for the Moorwens, we came up with a lexicon of sorts for how the beasts behaved. For instance, we figured out how they would illuminate when "luring in prey" and how they would "light up" when attacking. There is a great scene, which unfortunately didn't make it into the movie, where the Moorwen lures a little Viking boy into the forest at night. The Moorwen is completely hidden in the blackness of the trees with only the tips of its tails lit up: little lights dancing around with an eerie blue glow. It was really spooky. Then, wham! A big bright disorienting flash of red and white blots out the frame! On set, we worked with various practical lighting instruments to help create these effects by casting "interactive lighting" on the actors and their surroundings. In some of the more complex scenes, we used a computer controlled Vari-Light which Pierre Gill had programmed after seeing some of the pre-visualizations and research that we had done. We also used a system of special strobe lights that were carefully placed amongst the trees and set pieces and then quickly set them off in sequence when the creatures attacked. When combined with stuntmen being yanked around by ratchet pulls, it made for some pretty exciting plates on which to add our CG creatures. Later on during post-production, when we had a little more time to think, we started designing exactly how the bioluminescence would appear on the CG creatures' bodies. It was basically a mixture of different layers of "war paint" which revealed themselves in ways similar to animated patterns we had seen in the deep-sea creatures. In the computer, Howard and I literally went through "spot by spot" applying the light to the creature's bodies. If you look closely, you may even see a few special cameos in a couple of the spots. Then, in Toronto, Jeff Campbell went through the big challenge of writing custom 3D shaders to create a bioluminescent effect that would appear subcutaneous when composited with the other layers of the creatures' skin. It added a whole other level (and a lot of work) to the compositing as well as the animation. Because it was a lighting effect, it had to "glow" into the surrounding skin and the surrounding atmosphere, especially in foggy shots. Also, because the light was an integral part of the creatures' character, it needed to be animated in very much the same way as you would animate an expression. As a matter of fact, in some shots, it's the only thing you can see of the creature at all, so it was important that we get it right. The blood of the Moorwens also had to be figured out since there was so much of it splashing around in the shots. Howard really wanted it to glow with bioluminescence, which meant we had to find a practical solution that would work even in non-visual effects shots, for instance when the blood would spray onto the actor's faces. Tony Kenny, our Special Effects Coordinator, ordered up a bunch of different materials for us to look at. We first tried some of the ultraviolet paints and tints. They were non-toxic, but quite messy and they also had the disadvantage of needing UV lighting instruments on set, which gave a purplish hue to the lighting. Also, they looked distinctly like pigment; they didn't really look like "glowing" blood. Finally, we ended up getting a bunch of those safety-light glow-sticks that you break in two and then they glow for a couple of hours. We got a good deal on a big lot of those, mixed a few colors together for our secret mix, and that ended up being our blood. It worked surprisingly well, and a fresh batch glowed bright enough to expose on film with quite a bit of light output. Another major technical challenge was the creature's interaction with fire, oil and water. Its one thing to create a cgi creature in a battle scene, but completely another to also cover it with realistic fire and dripping oil in the middle of a snowstorm! We planned on a hybrid approach consisting of the shooting of special physical elements, and the concurrent development of CG particles and shaders. I was initially very big on the idea on shooting lots of fire elements in black that we could track and layer on top of the creature, but our particle expert, Mayur Patel, was really in control of his medium and developed some fantastic CG fire effects that looked amazing. The CG fire was used to completely cover the creature, and we only used the photographic elements of fire "here and there" to give it that extra push it needed to truly appear photo-real. We also used real fire elements whenever the dripping oil would fly off the thrashing creature or in the foreground of a bunch of CG flames. We took a similar approach with the water splashes during the Moorwen battle that takes place in the middle of a waterfall. Some of the very distinctive elements of water dripping off the Moorwen's chin for instance are photographic in nature: we shot sheets of water dripping off of greenscreen shapes. These were then used in conjunction with CG water particles. Also, we shot physical elements for the foot stomps whenever the Moorwen's paws would pound into the dirt. There would be a real "splash" of dirt and straw flying up for each stomp. The basic animation of the Moorwen taxonomy was another big creative issue. With any new creature, you have to decide how it moves. The problem is there were probably as many styles of animation as there were opinions about them. There is a huge difference between how a cat sprints for instance, as opposed to how a bull charges, or how a dog runs, or how a Gorilla gets around. We wanted elements of all of these things, but using any single creature's gait didn't seem to fit the bill. Of particular concern was what to do with the feet. Should we have the Moorwen walk around on knuckles or walk around with digits extended? My focus was always on realism, and for me, walking around with digits extended was a little too fantastic and made the Moorwen look too much like a cartoon character. Its feet were quite large with the digits fully extended and they looked a little bit like floppy clown feet. Walking and running on its knuckles gave the animal a little bit more of a gorilla-like stance, but it looked more natural and more serious. It also gave the Moorwen much more of a powerful feeling when it did open up its digits revealing those huge claws. Deciding on the size of the Moorwen creatures was also a big challenge. Of course we wanted a powerful and imposing creature, however it had to be small enough to justify some the action that was scripted. If we made it too big, it started to feel like a dinosaur; too small and it just wasn't scary enough. There was one scene in which the Moorwen definitely had to be small enough that it wouldn't pull Kainan's arm out of the socket during a key piece of action. John Schimmel, one of our executive producers, was particularly adamant about this point and we ended up doing a series of CG scale tests of some of the key shots in the film. In the end we wound up with an adult Moorwen creature that was about 15 � tall. We did cheat it roughly 15% smaller for a handful of shots where it had very close human to human contact. Planning is essential in making sure the effects work needed is accommodated and that no one gets hurt on set and whatnot. How much time and thought goes into any given effects shot, and what kind of challenges does that present as far as communicating that to the physical or computer effects crews and making sure that you get the footage needed? Well considering the relatively large amount of money that is spent on a typical vfx shot, a significant amount of planning is certainly justified. This was especially true for the Moorwen battle shots in Outlander. Battles with the 3D creatures and other complex 3D scenes were planned way up front. Howard and I worked with a small team of modelers and character animators, some of which stayed on location with us in Halifax, to put a plan together for each shot. The animators blocked in the action with rough models and then we edited these animations together see how the scenes would potentially work. Then with all the department heads in the room, we would go over these pre-visualizations to discuss things such as what lenses to use, the camera moves, the choreography of the stuntmen, and any special set pieces or mechanical effects that we might need. We could also identify which elements we would shoot on the main unit set, and which would be better shot later against a process screen. The AD could also then monitor our discussions and at least make an attempt to allocate the necessary time to shoot the shots. On Outlander, we even went so far as to create overhead "action-maps" of the sets showing where to place stuntmen and rigs, the distances involved, where to place fire and mortars, and where to place the cameras, crane and lighting. This level of planning was the only way to get through some of these tough scenes. We had to move super fast to get through all the shots in the limited amount of time. While many shots are planned in this way, what really "throws a wrench in the works" is when inevitably, as the shooting of a scene evolves, these carefully planned shots become obsolete for whatever reason. This can happen very quickly and you have to think on your feet to redesign the shots on the spot, or even come up with entirely new shots. This is just the changing nature of film making on a set. How different is it planning for practical effects compared to effects shots where most of the effects are added in post by computer artists? This is a great question. There is a big difference between planning for digital work and planning for shooting. In the digital part of a production, there are huge crews, typically sitting behind computers, dedicated solely to the production of the visual effects. It is usually somewhat calm and relaxed. The shooting part of a production conversely is more like a wild beast flailing around on fire, (not unlike the Moorwen itself) and the vfx department is just one more department fighting for precious resources. However, to make good vfx, you do have to tame the wild beast somewhat. Compounding the difficulty is that on many shows the visual effects department during the actual shoot is quite small (or even non-existent.) We rely in large degree on all the other production departments in getting the things we need during principal photography. We have to work with, and even convince in some cases, the various departments and especially the assistant director to allot the necessary resources and time on set to achieve these things. The key is to work closely with each department and prepare them to be flexible when the time comes. For instance, the flexibility to instantly add or take away smoke or snow during the take... to add more lights or pan them off... to quickly rig monofilament pull-lines to props in the set... to have actors or extras jump in or out of the shot for clean plates, or the flexibility to cover the scene with the a series of "tiled" camera lock-offs as opposed to a pan and tilt. It really takes a leap of faith and a relationship with each department to make this work successfully. As a vfx supervisor, you do try as much as possible to plan out these types of things in production meetings, but as conditions on set change, so must your plans. It's a bit like asking a D.P. to plan out exactly how he will light a scene before he gets there. Of course he has a general idea, but the exact details can't be know until you get on set. I thought we did this very well on Outlander, our director of photography, Pierre Gill and gaffer Bob McCrae really bent over backwards to help create interesting lighting effects for the creatures. This is not easy to do when the producers and AD are pulling their hair out to get us to move on to the next scene. I also have to give a lot of credit to Tony Kenny, our special effects coordinator, who was not only great at rigging great explosions, but also was a magician with creating snow on the set, and in just the right places to accommodate the 3D creatures. He set up a special system of fans that could layer the snow in foreground, mid-ground and background. Instantly, he could turn off the various layers whenever we knew that we would be compositing something in that shot. The melding of sci-fi and period piece has challenged the expectations of some of Outlander's potential audience. Was there also a challenge or difference when preparing for effects work for things like space monsters and rocket ships compared to the swords and shields aspect of the film? Sometimes the best stuff comes from when you bash two things together. For instance, there is a part in the film where our Viking characters salvage some of the futuristic metal from the crashed spaceship and forge "new and improved" Viking weapons from it. It was a simple concept, but very effective. On a more practical level for the visual effects, mixing the genres primarily it meant that we needed a wide variety of visual artists to realize the work. We had an interesting mix of hard surface modeling, soft body creature modeling, organic effects animation, and traditional 3D animation... even miniature work. We drew from artists from all over the world to achieve this range of work. Our Animation Director, Dusan Strugar, came over from Europe. We had matte painters, compositors and character animators from Los Angels, Toronto and Vancouver. We also had specialty designers to concentrate on the individual aspects that they excelled at. For instance, in Los Angeles, Patrick Tatopolous was enlisted for his extraordinary creature design and sculptural skills. Gene and Chris Warren over at Fantasy II Film Effects contributed their great miniature work and underwater filming expertise. Also in order to minimize duplication of genres within the digital teams, we split the digital work up along conceptual lines to different facilities. For instance, Spin Toronto really focused on the creature work and the more traditional matte paintings, while most of the futuristic shots went to Spin's facility in Vancouver and a few other companies even focused on the more individual aspects of that. I'm certain everyone will be focused on the Monster in the film. But there are many other effects elements in the film that most moviegoers might not ever really notice. Can you tell us a bit about some of the other effects elements and the challenges they presented? For example, most of the shots of the village and inlet had mountains added in post. Well, one thing is for sure, we didn't go to Halifax for the scenery. Halifax is a beautiful coastal town, but it is very flat. Norway on the other hand is supposed to have lots of mountains and fjords. There were very few wide establishing shots in which we didn't have to enhance the scenery by adding mountains, waterfalls, or more interesting skies. We shot plates around the globe to help extend the Viking world. For example, for the mountain lake where the spaceship crashed, we shot plates on Lake Wenatche in the Cascade Mountains of Washington State. Most of the fjords and waterfalls in the film came from helicopter photography way up north in Norway and also from Gross Mourne Provincial Park in Newfoundland. Also there were a lot of digital extensions of the Viking village itself. David Hackl, our production designer did a remarkable job of building as much as possible of the Viking village, (and it was a big village.) but the great big "Shield Hall" was finished out digitally in all of the shots. We even digitally extended the great big tree growing from the inside of the hall, up and out through the roof, something that would have been very expensive to build entirely practically. Were there any times on set where the planned effects just didn't work out and you had to go back to the drawing board? Perhaps to come up with an alternative solution? There is a scene in the film where the Vikings try to trap one of the creatures in a big pit filled with whale oil. The creature falls into the pit and splashes around violently, so we needed to generate a lot of great splashing elements with the oil and debris. It sounds great in concept but in reality we had a lot of problems with it. We ended up making the oil pit in four different ways, each of which had its set of problems. First we tried to dig a big pit on the exterior Viking village set. This proved to be problematic because in the dead of winter the ground was alternately flooded and then frozen, making it extremely difficult and expensive to dig. I think we got down about a foot, which just wasn't quite enough to do much of anything in. Then we built a full size pit about four feet deep on a converted stage in Halifax, in which our actors were able to splash around in semi-comfort. The problem here was that we only had one single day on the stage to shoot this particular scene. It was barely enough time to shoot the shots of the actors, let alone any vfx elements for shots of the creature. Tony Kenny did manage to build a big dump rig and water ramp in which we got some nice interactive splashing for our actors, but that was the limit of what we could do with the time. We also had to make some concessions with the look of the oil. Initially we were going to add methylcellulose to the water to thicken it up to the consistency of whale oil, but with the tight schedule, and the risk of damaging the only pool heaters we had, the decision was made to just go with plain old water. This was a bit unfortunate, but it actually looked pretty good in the editing room. Fortunately not too many people know what whale oil looks like anyway. Eventually we ended up building a miniature half-scale oil pit at Fantasy II Film Effects' stage in Los Angeles. Gene Warren (the third) volunteered for the part of the struggling Moorwen. Armed with water hoses and scuba gear, he submerged himself in the "oil" to help generate miniature splashing elements. We got a lot of great elements this way complete with miniature Viking shields and debris splashing all over the place. I was also happy as the reduced scale effectively doubled the viscosity of the water. Finally, the Spin team really enhanced the scene when they composited it all together by adding additional splashing elements from the library that we had been amassing. All in all, it was a really tough nut to crack, but I really like the way the sequence turned out. You've been pretty busy since outlander wrapped. What can we look forward to seeing in the Future? What upcoming projects do you have on the table? I'm involved in couple of pictures right now. One is called "The Rani". It is an Indian epic about a queen turned war hero who, with her child strapped to her back, rode into battle and led India to rise up against the British during their occupation in the 19th century. However, the next one on the slate is called "Ironclad." This is the true story of the siege and near destruction of Rochester Castle in the year 1216, right after the signing of the Magna Carta by King John. It is being shot on location in England and stars Megan Fox, James Purefoy, Paul Giamatti, and a host of others. Ironclad is quite a bit different than Outlander in that it is a true story, and the tone is quite realistic, very serious, and extremely violent. Outlander was violent, but this is really on another level. A bit more like watching a car accident than watching a "stylish" shot of the Moorwen skewering some Viking. Warfare and sieges back in those days was not a pretty affair. It's going to have a lot of great miniature work also. We will be relying on miniatures heavily to create the extensive damage to castle caused by the giant siege engines: trebuchets, ballistas, and siege towers. This sounds like it will be a lot of fun to shoot as well as to watch the rushes! Miniatures are always a blast. Thanks for your time. We much appreciate it.